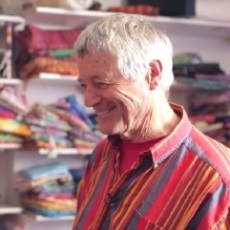 A rare opportunity to spend the day with world famous textile and colour guru’s Kaffe Fassett and Brandon Mably. Kaffe Fassett and Brandon Mably will be taking you through the same process they use for designing their own quilts, choosing colours that work together and getting you to move out of your colour comfort zone. You will be arranging your fabric pieces on a design flannel that you’ll just fold up at the end of each workshop, ready to take home and sew. You may keep your projects wall-sized or expand them to full size later. You will not be doing any sewing during the class. Day Workshop. Skill level: All levels. Quilt Style will be confirmed with Kaffe Fassett and Brandon Mably approximately 6 weeks prior to the class. The design will be one of the quilts featured Kaffe’s latest book (typically launched in August). The design chosen is the means for which you will explore colour. The design itself is not the important feature of the class; the class will explore colour and its impact on your compositions. Please note that each attendee works to the same quilt design. All composition will be done on a piece of neutral coloured flannel that is used as a design wall. No sewing takes place in the class. Please let us know at the time of booking if you have the Design Wall Flannel already, or if you need to purchase it from us. Quilter’s Flannel for a design wall AT LEAST 45″ x 72″ (approx. 2m), in a grey colour (available to purchase on the day, or in advance). If you already have this, please let us know so that we can leave wall space for you to set up your piece on the day. Note that Kaffe and Brandon do not recommend that you cut your fabrics prior to the class. You will very likely change your mind about colours and designs during the class, so it could be wasteful if you have done so. Whilst in the workshop you are encouraged to use any fabrics you would like to, however, you may like to use Kaffe Fassett and Brandon Mably Fabrics. Our standard minimum cut of all fabric in the warehouse is 1/2m, however, for those attending Kaffe Fassett and Brandon Mably workshops, if you wish to purchase in 1/4m lengths, that is absolutely fine. Our past experience is that you often change your perceptions of what you would like to put in your quilt after having spent time working with Kaffe and Brandon. With this in mind, we do not suggest that you pre-cut any fabric pieces prior to the start of the class. Coffee and tea will be served from 9.30am onwards until the class commences. You will have an opportunity to look around our Warehouse and purchase fabric and supplies prior to the class, during and even afterwards. Please note workshops do not include lunch. Bring a packed lunch with you or Tesco’s is very near. If you are unable to attend once booked, please let us know as soon as you are able. Refunds/ Partial Refunds will only be offered if at least 30 days’ notice is given prior to the event. Cancellation 60 or more days in advance: Refund given will be the full amount less 10% non-refundable amount. Cancellation 30 or more days in advance: Refund given will be the full amount less 20% non-refundable amount. Cancellation less than 30 days in advance: No refund will be made. Sometimes due to circumstances beyond our control, workshops and events may be cancelled. We will give you as much notice as possible should we need to cancel a class or event, and full refund will be given. We are not able to recompense for any incremental costs that you may have incurred to attend the class, should it be cancelled.